The 1848 Treaty of Guadalupe Hidalgo, signed after the Mexican-American War, ceded over half of Mexico’s territory to the USA. A few years later, under the 1853 Gadsden Purchase (Treaty of La Mesilla), northern portions of Sonora and Chihuahua were transferred to the USA. This established the current border between the two countries. Minor disputes have occurred since due to the migrating meanders of the Río Bravo (Río Grande) which forms much of the border between Mexico and the USA. Flooding during the early 1860s moved the Río Bravo channel south, shifting an area of about 2.6 square kilometers (1 square mile) from Ciudad Juárez in Mexico to El Paso in the USA. Both countries claimed the area, giving rise to the El Chamizal dispute. 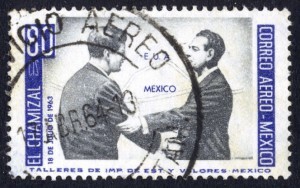 This dispute went to international arbitration in 1911 and was only finally resolved in 1963 with the ratification of the Chamizal Treaty. 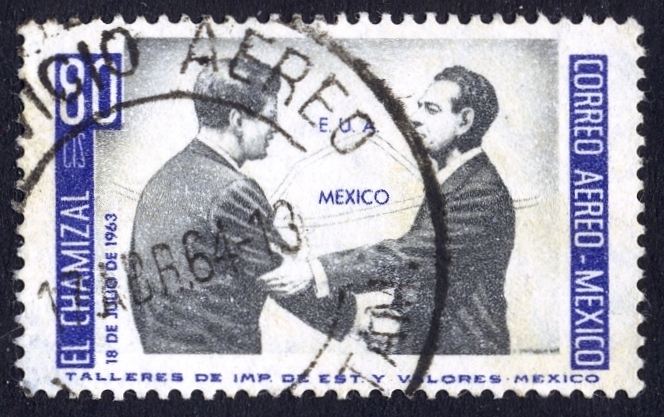 In 1963, President Adolfo López Mateos met his US counterpart John F. Kennedy on the border formalizing the end of the Chamizal dispute. The USA and Mexico shared the costs of rechanelling the river in an effort to prevent further migrating of its meanders. The concrete channel is about 50 meters (170 feet) wide and almost 5 meters (15 feet) deep. As we saw in July 2010, with the flooding following Hurricane Alex, even this size of channel is sometimes unable to contain the full flow of the river. A similar dispute, the Ojinaga Cut, was resolved in 1970. In El Paso, the Chamizal National Memorial was established in 1966 as a permanent memorial to commemorate the two nations’ laudable international cooperation, diplomacy and respect for cultural values in arriving at a mutually acceptable resolution to the conflict. The changing political frontiers of Mexico are the subject of chapter 12 of Geo-Mexico: the geography and dynamics of modern Mexico. If you have enjoyed this post, please consider purchasing a copy of Geo-Mexico so that you have your own handy reference guide to all aspects of Mexico’s geography.